Under “Social economy” REVES considers cooperatives, mutual societies, associations, foundations and, more in general, all those organisations asserting the “primacy of individual and of social objective over capital, the voluntary and open membership, the democratic control by membership, the combination of interests of members/users and the general interest, the defence and application of the principle of solidarity and responsibility, the autonomous management and the sustainable use of most of surpluses”. REVES Members are those local authorities or social economy organisation that are presently developing or are willing to develop policies to promote social and solidarity based economy, for a most fair, inclusive, participative and responsible society; a network of social innovation in terms both of methods and procedures based on co-construction and shared capacities of the members and their territories. REVES EXCELLENCE AWARD 2019: Call for Applications – extended deadline!! REVES gladly presents the new call for the 2019 edition of the REVES Excellence Award. 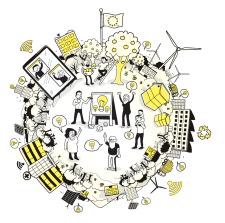 We are searching for best practice examples of real partnerships and co-construction between public authorities and the social and solidarity economy. It does not take much to apply and you can do it in different languages. Become a European Social Economy Region 2019!